Many people assume that the decision to overturn Roe v. Wade is simply a matter of brute force, as it were – i.e., achieving political victories that force through the appointment of enough previously convinced pro-life justices to achieve that outcome. Consistent with the injudicious temper of our times, no one appears to believe that rational persuasion, in light of rationally presented historical and constitutional evidence, persuasively argued, will dictate the result. However, I have good reason to believe that rational persuasion could prove more decisive than expected, once someone fearless of the charge of racism forces the sovereign people of the United States to confront the clear, plain language of the Constitution. For it’s hard to believe that, given a sufficiently coherent presentation of the conclusive evidence against Roe – which the Constitution contains – five justices will openly discredit the Court’s authority by resisting that evidence. For it satisfies the criterion acknowledged to be substantively decisive in the language of the decision itself. The appellee and certain amici argue that the fetus is a “person” within the language and meaning of the Fourteenth Amendment. In support of this, they outline at length and in detail the well-known facts of fetal development. If this suggestion of personhood is established, the appellant’s case, of course, collapses, [410 U.S. 113, 157] for the fetus’ right to life would then be guaranteed specifically by the Amendment. The appellant conceded as much on reargument. Thus, the deciding majority in Roe acknowledged that the issue at stake turns on the constitutional meaning of the word “person.” Though Roe cites the Constitution’s most relevant use of the word (Article I.2, cl.3), the decision utterly fails to analyze its supremely relevant implications. Though the U.S. Constitution’s First Amendment plainly states that “Congress shall make no law respecting an establishment of religion or prohibiting the free exercise thereof,” these words have never been construed to license naturally unlawful violations of the human person in the name of religion (like murder, for example, under the guise of human sacrifice.) Thanks to the Roe decision, those who support the murder of innocent children in the womb boldly claim that it is a “medical procedure.” Ironically, most of them oppose the death penalty, even though it is these days administered by means that one could also describe in those terms. But for that legal permission, however, a medical practitioner who took the life of an otherwise innocent and healthy human being would be guilty of murder, no matter what species of medicine he or she claimed to be practicing. However, the tendentious jurisprudence the Roe majority used to invent a so-called “right” to abortion avoids the charge of licensing murder by pretending that nascent human offspring are not human. Roe v. Wade camouflages the transparent idiocy of this ploy by substituting the word “person” for the word human, as if that substitution changes the nature of the life in question. The decision then proceeds to develop an argument based on the supposition that the word “person” implies an essentially different status than the word “human,” one that evokes a being morally, spiritually, and physically more developed than a nascent human child. However, when it comes to the U.S. Constitution, this assumption is demonstrably false. Apologists for chattel slavery often suggested that blacks were sub-human. They took this to the point of denying that they were, in fact, human at all. At the time of the American revolution, even people outside the slaveholding regions were wont to doubt that blacks qualified as fully developed human beings. Yet the word “person” – as used in the Constitution’s “three-fifths of all other persons” formula for representation in Congress – was especially intended to encompass enslaved blacks. This usage plainly refutes Justice Blackmun’s assumption in Roe that the constitutional use of the word requires or even implies fully developed humanity. Blackmun cites evidence to suggest that the meaning of the word “person” is sometimes extra-constitutionally deployed in some such sense. 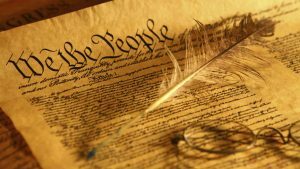 But in the three-fifths clause, the U.S. Constitution definitely abstracts from the issue of human development in order to include people whose entitlement to full humanity was, as a matter of historical fact, an unsettled question at the time the American people ratified the Constitution – and for decades thereafter. According to the prejudices of the time, the fully developed humanity of black slaves was widely doubted. Yet they qualified as “persons” for constitutional purposes. The 1828 edition of Webster’s Dictionary most likely reflected the understanding of the Framers. It defines a person as “an individual human being consisting of body and soul. We apply the word to living beings only, possessed of a rational nature…. It is applied alike to a man, woman, or child [emphasis mine].” The reference to nature in this definition ought to be decisive. For in the parlance of the Revolutionary period, natural right or justice was not a provision of human power, but of God’s prior authority. The principles of the American Revolution were often cited during the constitutional convention as the Framers’ touchstone for the crucial purposes and intentions of the government they meant to establish. The American Declaration of Independence epitomizes those principles. It ascribes the unalienable rights of human beings to the activity of the Creator God, not human institutions of law and judgment. We now know better than any generation in human history that the nascent child is scientifically recognizable as a human individual at every stage of its post-conceptional development – by the record of human ancestry now available to us from DNA analysis. This is true regardless of race or the stage and appearance of the body at any given stage. Therefore, we know that every nascent human child corresponds to the definition of the word “persons” as it applied to enslaved blacks at the time of the Revolution – and we know it with greater apodictic certainty than the Framers did when they presciently applied the word to my ancestors. It makes no sense to pretend that a constitutional word that definitely applied to people whom some regarded as questionably human – even as some people pretend to regard all nascent humans today – does not, as a matter of constitutional fact, apply to nascent infants, whose humanity we can now establish with scientific certainty, beyond a reasonable doubt. With full humanity established in constitutional terms, the assertion of personhood (for constitutional purposes) is more than a suggestion. It is, regardless of fetal development, a materially established fact – Q.E.D. In the face of this constitutional demonstration, Roe falls of its own weight into oblivion, according to the criterion agreed upon by all parties to the case. Regardless of action or inaction by the Supreme Court, enforcement of the Roe decision, and any state laws made pursuant thereto, is contrary to reason. It is contrary to decisively relevant language used in the Constitution itself. It is contrary to the premises of natural right and just government from which the people of the United States derive their authority to ordain and establish the Constitution. Though some human beings will always be demonstrably superior to others in some respect or other, their inferior state of development does not affect their standing as persons, within the meaning of the U.S. Constitution’s use of the word. My ancestors were persons, recognized as such for constitutional purposes. So are all the children of women and men, recognized as such by the information encoded in the very substance of their material life. If, as a people, we now reject that logic, then we reject the understanding of natural human equality that makes sense of our intrinsic right to self-government. Either we end the abortion regime, or we prepare the end of the regime of equal constitutional liberty we now enjoy as persons, endowed from the conception of our humanity with unalienable rights, regardless of the relative state of our power to make known or defend them for ourselves.